We all know the legendary status of the Rochioli family and how they are among the best producers of Pinot Noir in all of California. It's great to be able to taste a wine crafted by Gary Farrell using grapes from one of the Rochioli vineyard parcels. It's a small 240 case production and rolls in around $65 retail. 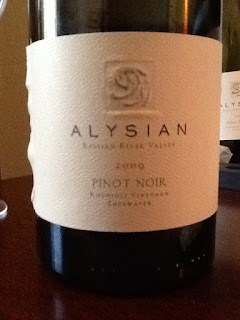 On the nose this wine is beautifully perfumed and in the classic Russian River style. I get aromas of wild red raspberry, cherry pie filling, wet stone, cherry turnover, and just a touch of oak spice. There is really amazing delineation of aroma and the wine really expresses the essence of the varietal.